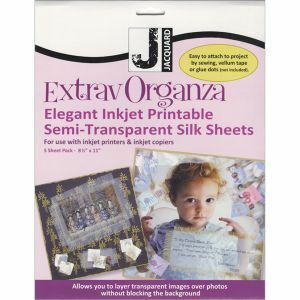 In this example, I transferred my photography onto printable organza. You can buy sheets at an art supply store or even an office supply store…certainly online as well. They are designed for ink jet printers only. I played with black and white photography and used a (more or less) abstract photo and began a collage. 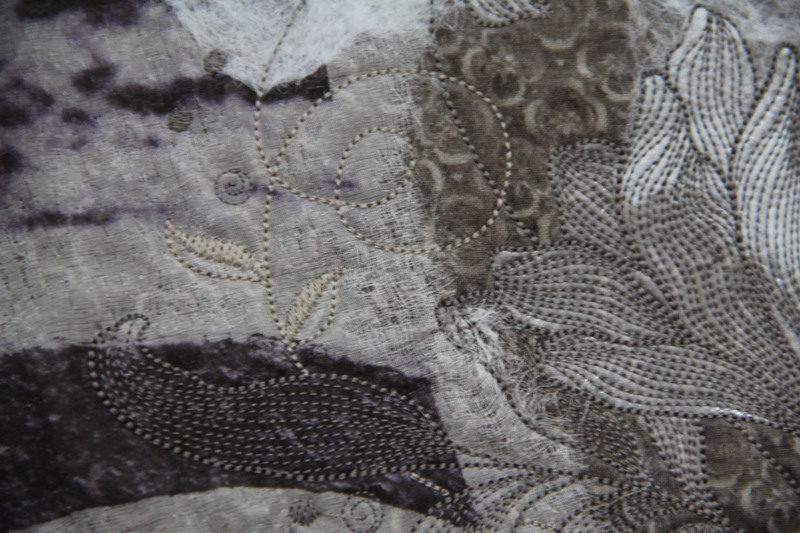 You can see from the photo that I added a number of different layers of texture — background fabric, organza photo, embroidery. In the detail below, you can get a good look at the needle felting used to attach the organza and the dryer sheets. 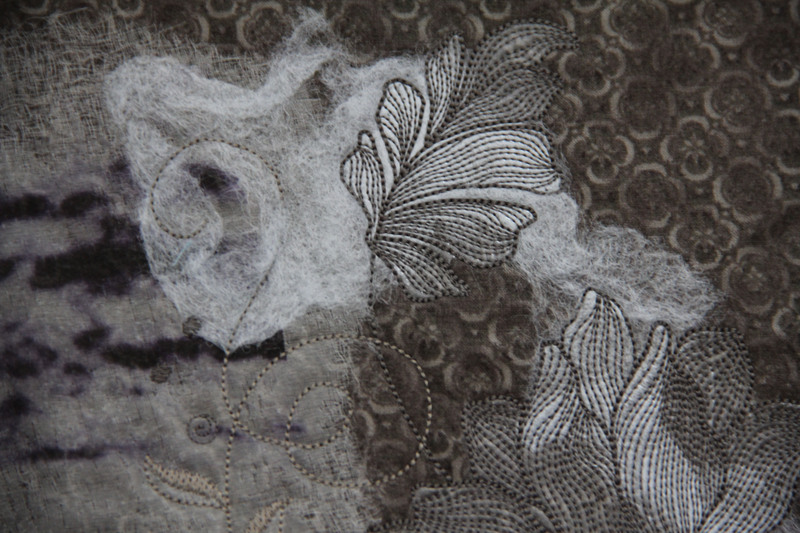 On the organza, the more felting I did, the more the organza began to sort of pull apart and shred, which gave it a wonderful, antique faded look. The embroidery over the top added a whole new level of detail and interest. This is one of those experimental pieces that gets more interesting the closer you look. I really enjoyed playing with textures other than simple quilt cotton. Our sewing machines are designed to sew through many different types of fabric and materials. While quilt cotton is easily accessible and stunningly designed these days, you just never know what fun things you can use in your “art quilting” travels. The upcoming Software Sampler from Bernina features some of the gradient and blending tools in the V6 Designer Plus software. I needed to create a sample and wanted to spend my time on something I could use…not simply a store sample. 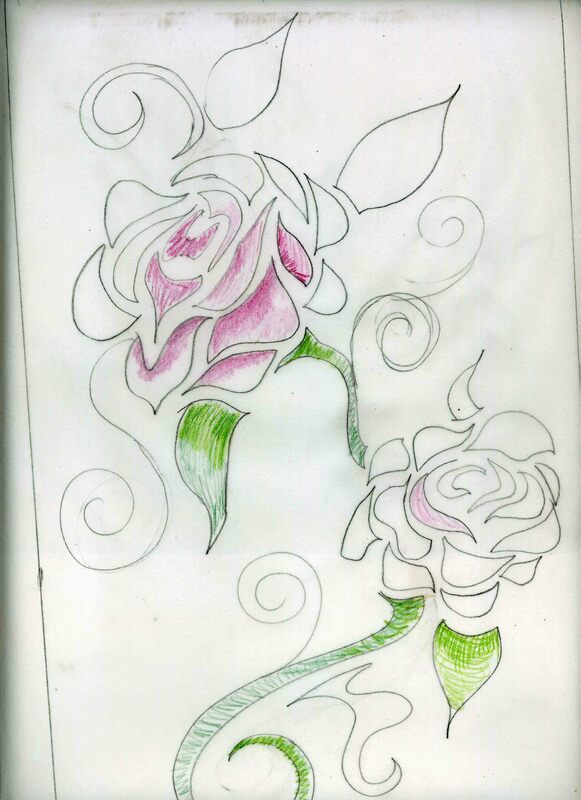 So I decided to create a design of roses that would in some way match up to the peonies I needle punched some time ago. 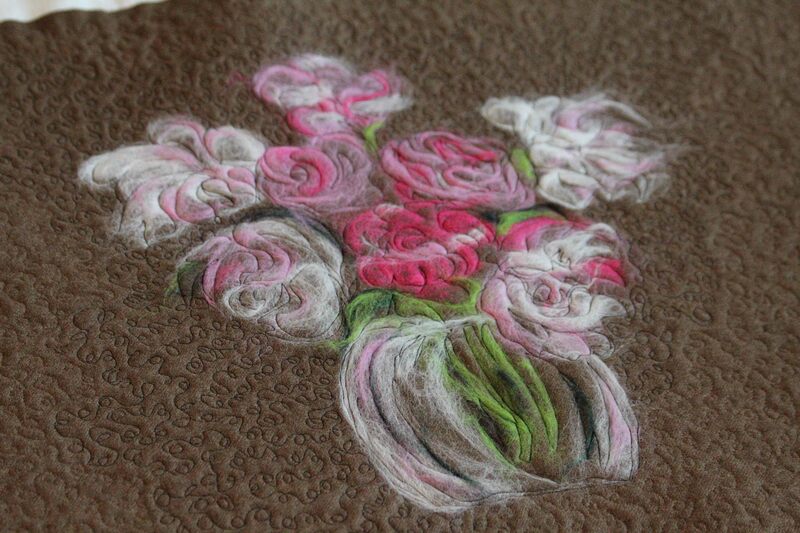 I thought maybe I could use up more of the wool and embroider some matching designs. This is not an intimidating thing to do, it just takes the courage to map out a sketch and think through the order of the stitches. 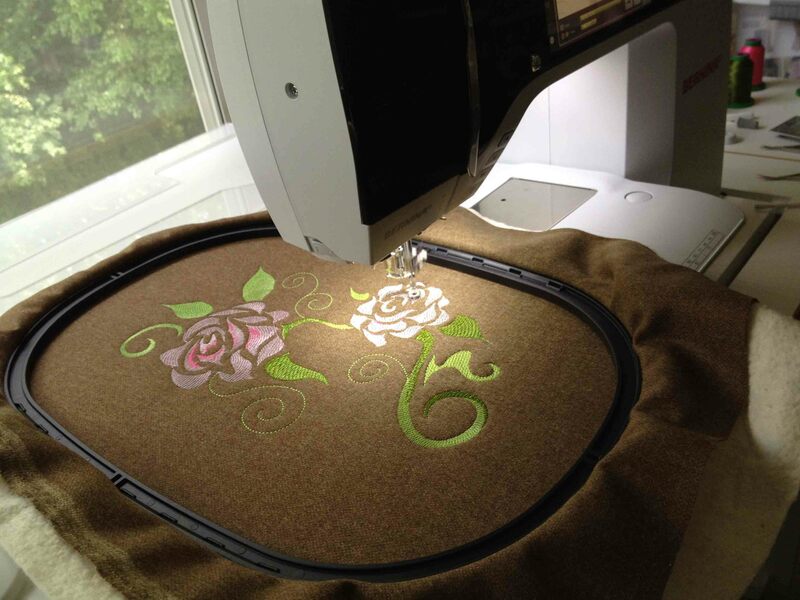 For those of you with machine embroidery capabilities, it also takes some software. But the truth is, if you can trace something in pencil, or draw it freehand, you can easily turn it into machine embroidery. All it takes is a little time and practice. As you can see, I started to test out some colors and blending ideas as well as just the basic shapes. At this point, the sketch does not have to be perfect, the drawing only has to give you a basic idea, although, the more accurate here, the less guess work in the software. The scan of the artwork is then loaded into the V6 software, and you can simply begin to create the shapes right on top of the image. Once the basic shapes have been digitized, just delete the image from the background. 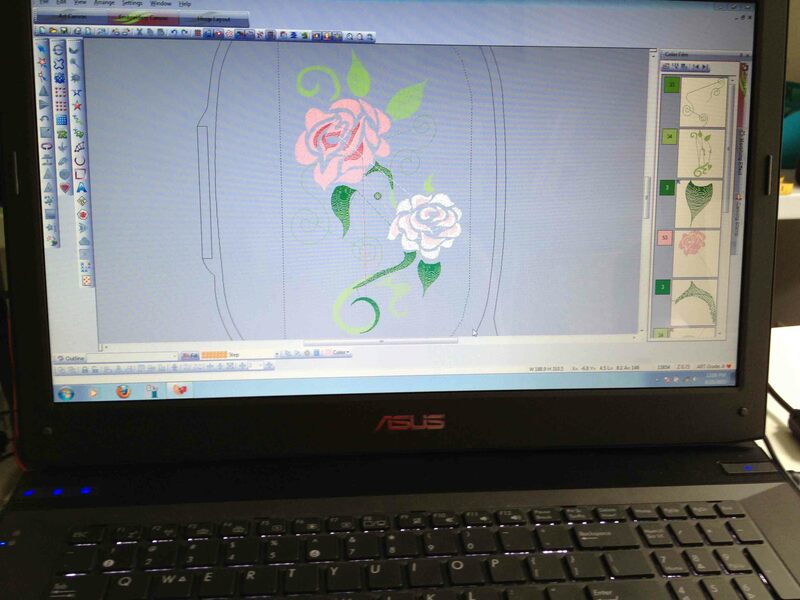 Digitize section by section, piece by piece, in the order that you want the design to stitch out. On this design, I was particularly careful about stitch density. Since this design was being created in the jumbo hoop, it had the potential to be very stitch-heavy. I wanted to keep the count down. The way to do this is to go into object properties under the fill tab and make adjustments to the fill stitch size and spacing – on each shape as you digitize. This can be time-consuming, but is so worthwhile. 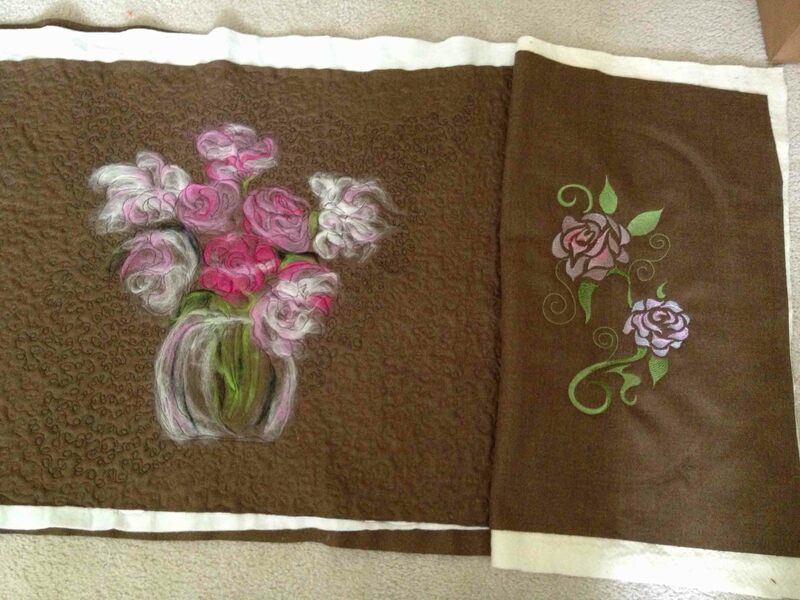 The total stitch count on this design was under 17,000 stitches. Without adjustments, it could have gone up to 30,000 or 40,000 or more. A good look at the stitch spacing and length. You can see this will not be a dense design. Obviously , this quilt is still sorting itself out in my mind. But it’s beginning to come together. Machine embroidery possibilities are endless. It just takes a little time to learn the basics. You can do this too, I assure you – with almost any image. I am clearly not a master digitizer. The only requirement is a willingness to jump in and try things. 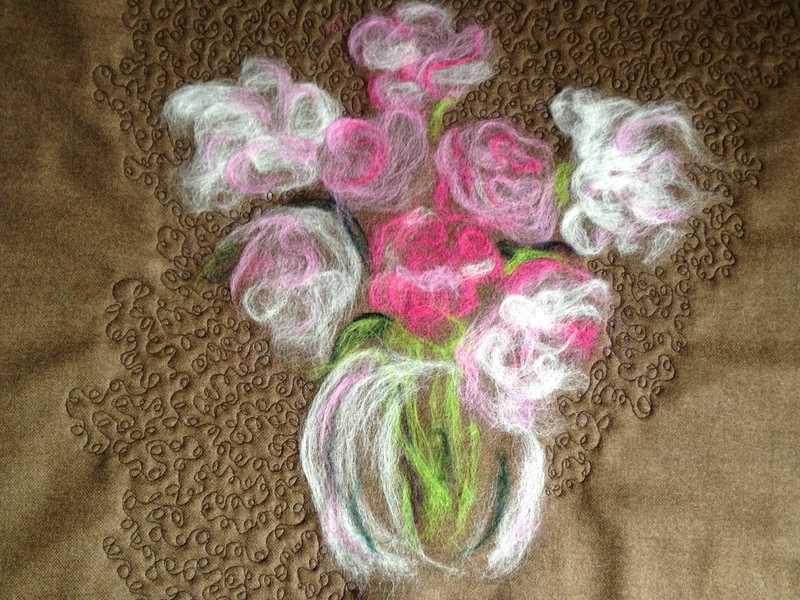 As I wait for this years’ peonies to find the courage to rise and bloom, I am inspired by a picture of last years’, and so I pulled out some wool, some roving and decided to needle punch a bouquet of peonies. If you are not familiar with needle punch, it is the process of using needles to insert colored fabric into another fabric. The process of punching the roving into the wool actually creates a whole new fabric because both fabrics become one. 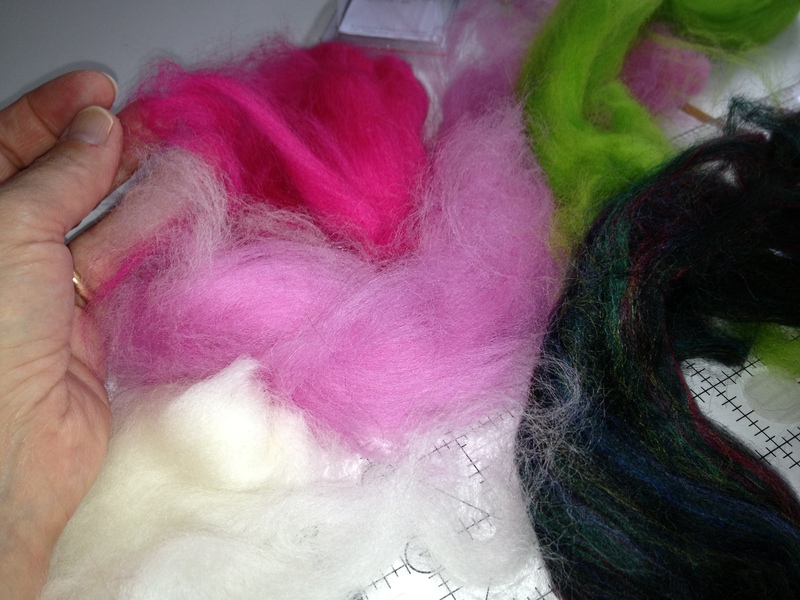 Here’s an example of some roving, which is essentially semi-processed wool or cotton fibers. Needle punching on the sewing machine. 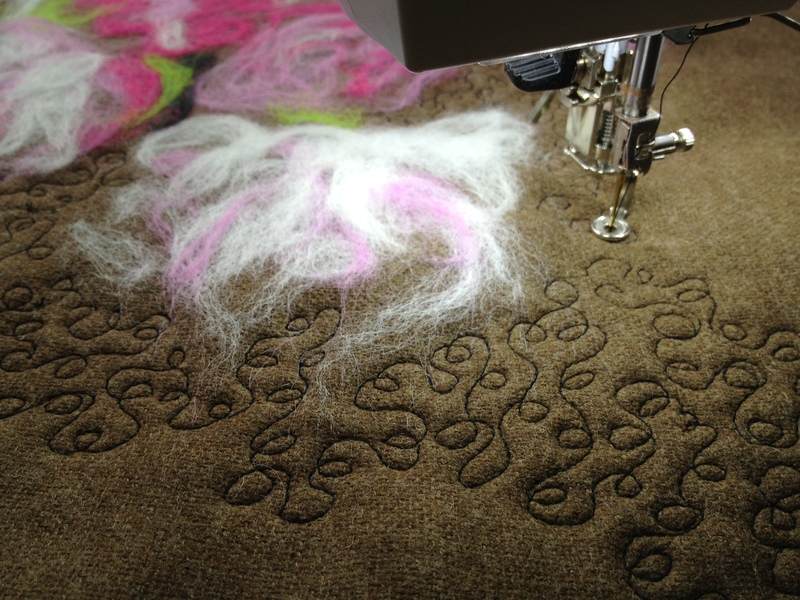 Using special needles on a machine and a needle punch foot, you can use your sewing machine to “punch ” the roving down into the wool fabric below. 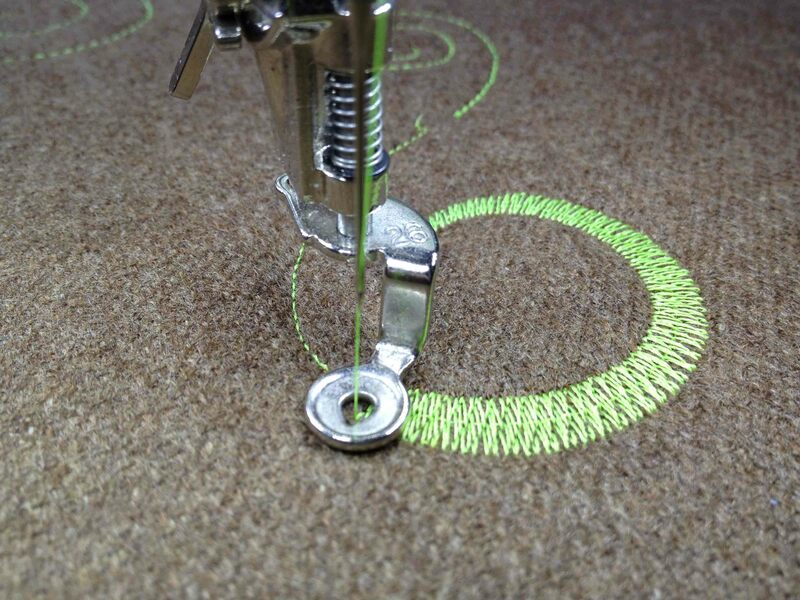 You’re not using any thread, and if you have thread sensors on your machine, you’ll want to turn them off. After that, the process is a lot like painting with watercolor, or more precisely, like charcoal drawing, using the different colors of the roving to create shading, shapes and color. After punching out the basic shapes, just add some background texture. 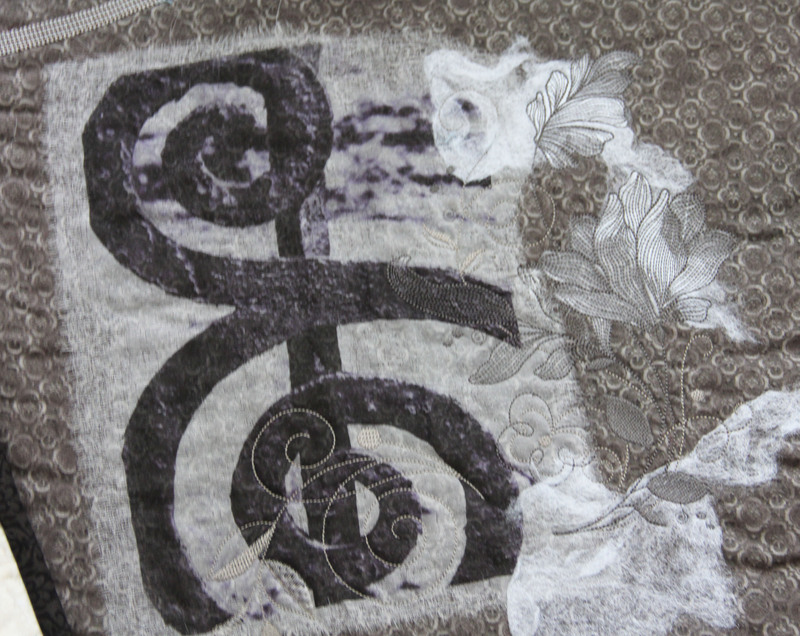 Adding texture through small quilting patterns. Add batting to the back for stability. What it looked like before topstitching. As the final touch, add topstitching to the whole arrangement. This brings a bit of dimension, with a “pen and ink” feel. All of this is very textural. Interesting to look at, interesting to touch. Anyone can do this with a little inspiration, some wool, and some roving. You can purchase hand needle punch kits at any craft store and I’m sure most sewing machine manufacturers have some form of needle punch accessory. (Bernina does, for certain!) After that, the sky’s the limit. 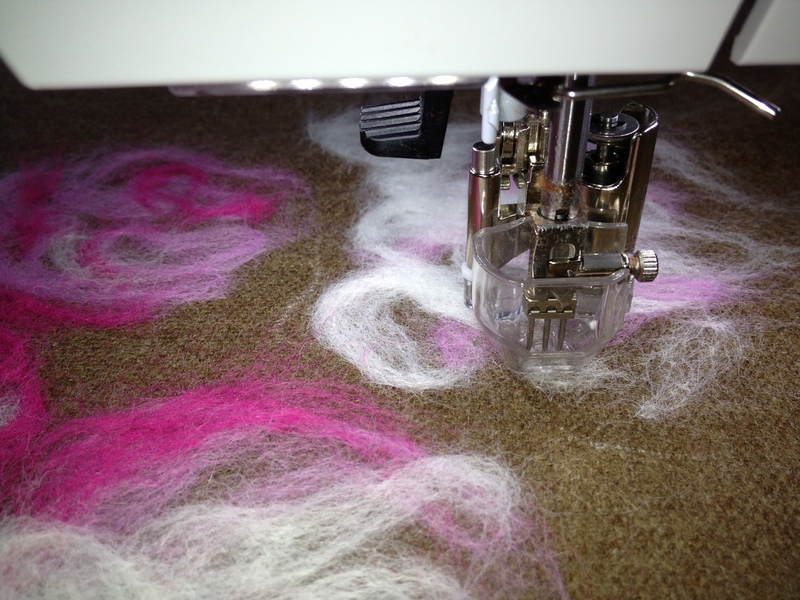 Machine tip: Be sure to clean out your sewing machine really well after doing needle punch. Now get out there and have fun!! Final piece. Not sure if I’ll turn it into a pillow cover or garment or something else entirely!